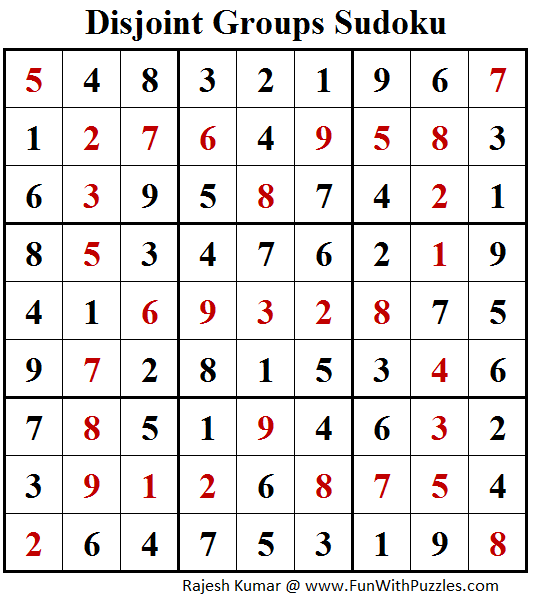 To create Disjoint Groups Sudoku, it have taken many attempts from me to get it correct. Most of the time this puzzle type has been easy which does not use much of variation rules. So many of such puzzles I have been publishing as Classic Sudoku only after make minor adjustment. Today's Sudoku is one of the few Sudoku of this type which has been correctly using the Disjoint Groups Sudoku variation rules. Another one which uses rules fully was Disjoint Groups Sudoku (Fun With Sudoku #153) which I created for Sudoku Mahabharat 2015-16 Math Variations round. I need to practice more of this Sudoku to get comfortable before creating more Sudoku of this type. Soon I am planning to create few more of Disjoint Groups Sudoku. 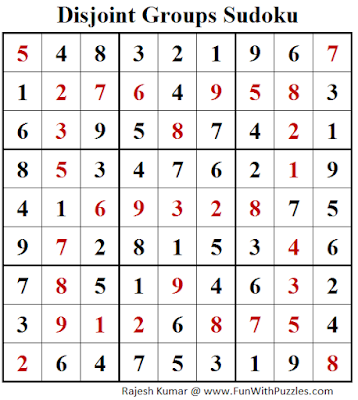 Meanwhile I am posting this Disjoint Groups Sudoku in Fun With Sudoku Series as 172nd puzzle in this series.